Director: Ruggero Deodato / Writers: Alex Capone, David Parker Jr., Sheila Goldberg & Luca D’Alisera / Cast: David Hess, Mimsy Farmer, Charles Napier, Nicola Farron, Bruce Penhall, Luisa Maneri, Andrew Lederer, Stefano Madia, Nancy Brilli, Cynthia Thompson, Elena Pompei, John Steiner, Valentina Forte. If you were channel surfing late at night around, say, Halloween and you happened to catch a few minutes of the wonderfully titled Camping Del Terrore, I’d forgive you for thinking it was a nameless Friday the 13th sequel, something like No. 6 or 7. 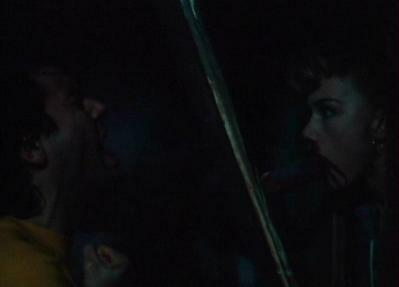 ‘That’s Camp Crystal Lake,’ you might say to any companions you happen to have. ‘They’re counsellors…'; ‘there’s Jaso- Oh, wait a sec…’ Yes, Ruggero Deodato, who directed Cannibal Holocaust back in the 70s, is so very similar to Vegan Voorhees’ fave franchise that you could probably slip the video tape into a Friday box and fool small children and your grandma. In the proper 80s, not those intrusive fake 80s, a camper-load of teens – some of whom suspiciously have Italian accents – roll into the Colorado campground where the murders, blamed on the standard local tale-of-doom character the ‘Old Indian Shaman’, occurred and subsequently sent admissions plummeting. The camp is owned by super-unhappy couple Robert and Julia, who very briefly cheer up when their son Ben hops out of the camper, having returned from the army and hooked a ride. Robert is played by David Hess, one of the loonies in Last House on the Left and directed the almost-enjoyable To All a Goodnight. He’s not very nice to Julia, which explains why she’s screwing the local Sheriff. No sooner do more campers show up, so does the ‘Old Indian Shaman’, ready and able to make holes in nubile teenage meat with knives n’ stuff. To us, it’s obvious that the Shaman is little more than some psycho in a cloak and mask, unless mythical monsters wear hefty black boots. But who could it be? Moody Robert? Oppressed Julia? One of the teenies? Extra suspects are tossed into this Italian gore salad by way of ‘The Doctor’ (…not David Tennant), dad of the opening victim who scowls ‘I hate campers!’ to the Sheriff when a couple of soon-to-be extinct lovers paddle by in their canoes. The teen-wasting project soon begins with a hunt for a missing chick after her boyfriend stumbled back to camp and then lapsed into a coma (!). Unfazed by this development, the rest of the gang continue to flirt, strip off at a moment’s notice, play juvenile pranks and obsess over ‘doing up’ a dilapidated shower block they find in the woods, which happens to be the scene of most of the killings that ensue. At this time, the Shaman obviously grows bored of how long it’s taking to kill people and attacks biker-dude Dave (Bruce Penhall), who, along with moody Carol, has hastily been shoved into the role of hero/survivor as if Deodato completely forgot about electing a Final Girl until the finale loomed. Ben rescues Dave and, without any rational thinking whatsoever, no brainstorming, no information gathering, concludes that the ‘Old Indian Shaman’ is back to KILL! KILL! KILL! About now, things get a little complicated… Julia finally has a violent reaction towards Robert and thinks she’s killed him and when moody Carol runs in after finding some of the bodies, Julia, assuming she means Robert, confesses to murder and follows moody Carol into the woodshed where, it turns out, Robert is far from dead and, in turn, fatally slashes his wife down. THEN… shaggy perm girl also discovers the same bodies moody Carol did and, when fat comic relief dude comes to rescue her, he makes the undoable error of running into a complex bear trap. Take a breath… OK, moody Carol tries to chainsaw her way out of the woodshed and is eventually rescued by biker Dave and the remaining few people take shelter in the main cabin and the Sheriff shows up. Some additional death transpires before the ritual unmasking happens. Things go down like a gored-up episode of Scooby Doo before the two surviving teenies are sent on their way to assumedly live happily ever after following their fifty-four second relationship blossomization from earlier on and the Sheriff takes the law into his own hands, only to – possibly – be thwarted by a real ‘Old Indian Shaman’! Alas, we end on a freeze frame and never find out the truth. Well, not a version of it that you could reasonably swallow anyway. Camping Del Terrore is 80s horror epitomised: nobody does anything sensible, there are subplots that don’t mean anything and the whole package makes no immediate sense. It’s like a toasted cheese sandwich where the bread is made out of big hair and tinny pop-metal. Still tastes pretty good though. When I first bought it on VHS an acquaintance said ‘Bodycount… that was in every video store in the 80s.’ Well, yay, I say. Let’s hope lots of people rented it and thought it rocked, because it did. For me and those like me (smirk…) it still does, more so in the face of all the crappy, heartless remakes doing the rounds right now. Deodato, nobody may have saluted you at the time for this one, but Vegan Voorhees does. *love* *love* *love* the opening theme music!